I’ve written about each edition of Festival Márgenes since 2014, usually in the form of an overview but sometimes going into a bit of detail about films I’ve particularly liked (click on the year for the relevant post: 2014, 2015, 2016). The festival focuses on films without distribution, made on the margins (or outside) of existing film industries in the Iberian Peninsula (Spain and Portugal) and Ibero-America (Spanish and Portuguese-speaking Latin American countries). Standouts from previous editions include África 815 (Pilar Monsell, 2014), El gran vuelo (Carolina Astudillo, 2014), La sombra (Javier Olivera, 2015), No Cow on the Ice (Eloy Domínguez Serén, 2015), and Pasaia bitartean (Irati Gorostidi, 2016). The Luis Ospina retrospective includes 20 films (shorts and features), also free to view. No indication is given about subtitles, but generally those films not in Spanish have (Castillian) Spanish subtitles and often a lot of the Spanish-language films have English subtitles – but as I’ve said in relation to previous editions, they’re all free to view, so it won’t cost you anything to just click on one and see if subtitles appear. As I mentioned in my post yesterday, I’m intending to watch the films by Gabriel Azorín, María Cañas, and Luis Macías as a starting point. But my experience of Festival Márgenes is that they always have a really strong line-up – I usually only manage to watch a handful of films from a given edition but I’ve never watched a dud – so although some of the films might not be your kind of thing, you should be able to find something interesting that you would not otherwise get the chance to see. I have previously written about the 4th and 5th editions of this Spanish online festival. Specifically dedicated to films – from the Iberian Peninsula (Spain and Portugal) and Ibero-America (Spanish and Portuguese-speaking Latin American countries) – whose form, style, or duration mean that they will struggle to access the normal distribution routes or obtain a commercial release, Márgenes initially takes place in key cities in Spain, Mexico, Chile and Uruguay at the start of December, before moving online during the second half of the month. Documentaries and experimental films tend to dominate the selection. The online side of the festival makes the films free to view. Sometimes there are rights restrictions on specific titles in certain countries – at the moment Generación Artificial and Santa Teresa y otras historias aren’t visible to me, but I don’t know if that’s a rights issue or just a glitch on the website. Films that aren’t in Spanish tend to have Spanish subtitles, but in past years the majority of the Spanish-language films have had English subtitles. The subtitles aren’t listed on the website – I’ve put a * next to the trailer links below where the festival has used a trailer with English subtitles, which is often a good indication of there being subs on the film as well [UPDATE: this hasn’t been a good indicator this time around]. But given that the films are free to view, you aren’t going to lose anything by starting a film to see whether subtitles appear. I never manage to watch everything, but I will update this post to indicate the presence of subtitles on any films I watch [UPDATE: I’ve watched two and looked at a third – I’ve added the subtitle info below]. The previous editions I’ve explored have revealed gems such as África 815 (Pilar Monsell, 2014), El gran vuelo / The Great Flight (Carolina Astudillo, 2014), and La sombra (Javier Olivera, 2015) (the latter was my favourite in last year’s festival). I can recommend No Cow on the Ice (I reviewed it earlier this year) and personally will be aiming to at least catch Pasaia bitartean, Santa Teresa y otras historias (if it’s available), and Las letras (on the basis that I’ve read positive things about them in relation to other film festivals). The festival announced its prizes yesterday – I’ve marked the winners below as well. The Márgenes Festival 2016 also includes a retrospective of the work of Lluís Escartín, titled ‘no tengo nada que decir, prefiero escuchar. 30 años documentando lo invisible‘ [I don’t have anything to say, I prefer to listen: 30 years documenting the invisible], and a cycle dedicated to Chilean director José Luis Torres Leiva, ‘Un lugar en el mundo‘ [A place in the world] – they are likewise free to view online until 31st December. Sunday being a day of rest, it was only appropriate that I should catch up on some sleep (and also write the first of these postcards) – so the first film of the day for me wasn’t until 5pm. Under Sandet / Land of Mine (Martin Zandvliet, 2015) – one of the Official Selection (competition) titles – is a Danish-German co-production that tells a little-known story from the aftermath of World War 2, namely that German soldiers were used to clear mine fields in countries that had been under Nazi occupation during the war. Some two million mines had been laid along Denmark’s western coast (someone apparently thought that it was a possible site for the Allied landings that would in reality occur in Normandy) presenting an obvious danger to the civilian population. 2,600 German troops (most of them teenagers recruited in the dying days of the war) were put to work defusing and removing the mines, having been told that they would only be allowed to go home to Germany once every mine had been recovered. The film gives two points of view: Sargent Carl Leopold Rasmussen (Roland Møller), an experienced Danish officer who is overtly and openly hostile towards the German forces who occupied his country (the English title obviously has the double meaning of ‘my land’ and ‘minefields’); and the young German soldiers (most notably Louis Hofmann, Emil Belton and Oskar Belton – the latter two play the team’s youngest members, a pair of twins who are barely in their teens) who he must train as a bomb disposal unit. If the treatment of what is an interesting story perhaps leans towards the conventional (the narrative arcs of certain characters is telegraphed from early on and although there are several sequences of high tension in relation to the bombs, that tension cannot be sustained for the duration (that said, I jumped in my seat at least three times)), the acting is great (a lot of it communicated silently through gesture and expression) and the characters are differentiated sufficiently for us to become invested in what happens to them as individuals. The second film screening from the Convergencias selection was Risttuules / In the Crosswind (Martti Helde, 2014) – chosen by David Tejero (you can read his text on the film, here). I think that this will end up being my favourite of the festival (unless something astounding comes along) because it is utterly original in form and visualisation, and emotionally devastating – in contrast to the majority of screenings where people start chatting and filing out during the end credits, in this case you could have heard a pin drop and barely anyone got up from their seat until the credits had ended. This is another film that tells a little-known story in relation to World War 2: Stalin’s ethnic cleansing of the Baltic states from the early 1940s onwards involved thousands of citizens from Estonia, Lithuania, and Latvia being forcibly sent by train to remote outposts in Siberia. Their predicament continued after the war ended and most were unable to return to their homelands until some time after Stalin’s death in 1953. In the Crosswind tells the story via a series of letters (heard in voiceover – there is no spoken dialogue in the film) based on those written by Erna Tamm (played by Laura Petersen) as if to her husband Heldur (Tarmo Song) after they were separated during the removals. But the most arresting feature are the black and white tableaux vivants through which Helde conveys those moments when time stands still for us at those junctures when our lives are irrevocably changed. People stand stock still, emotion frozen on their faces, captured in moments of rupture and turmoil. The camera moves through a given scene in one continuous take (as far as I recall) – with the sound continuing as if everything were in action – and the staging is ingeniously blocked-out in such as way so that the movement of the camera through the tableaux allows a set up to change without cutting. The best example of this is a sequence where the camera is moving through an interior and passes a series of windows with pillars of wall in between them – the camera keeps slowly moving and each time we see the view out of the window, the (frozen) action has moved on, telling a violent and horrific story. The effect is a bit like looking at individual frames – or still images – taken in succession. It is genuinely unlike anything I’ve seen before and I hope that I can see it again. My last screening on Sunday was one of the FICXLab (experimental) sessions showing two films by Robert Nelson: Suite California & Stops Passes Part 1: Tijuana to Hollywood via Death Valley (1978) and Suite California & Stops Passes Part 2: San Francisco to Sierra Nevadas & Back Again (1978). I found the combination of sound and image to be quite discombobulating. Part 1 features a spoof of the narcotrafficante ‘genre’ border crossings and there is humour throughout, usually via the juxtaposition of sound and image, but what emerges across both parts is multi-faceted portrait of California. The recourse to historical facts and monuments – giving a kind of historical layer to the presentation of landscape and place – reminded me of James Benning’s Deseret (although in visual terms they are quite different, as is Nelson’s focus on people within the spaces he explores). Monday started with The Sky Trembles and the Earth Is Afraid and the Two Eyes Are Not Brothers (Ben Rivers, 2015), another discombobulating film and I still don’t know quite what to make of it. It starts as a ‘making-of’-style documentary, showing Spanish director Oliver Laxe making his new film, Las Mimosas, in Morocco. The press kit probably has the best synopsis of what happens: ‘Shooting against the staggering beauty of the Moroccan landscape, from the rugged terrain of the Atlas Mountains to the stark and surreal emptiness of the Moroccan Sahara, with its encroaching sands and abandoned film sets, a director abandons his film set descending into a hallucinatory, perilous adventure of cruelty, madness and malevolence. A Paul Bowles story combined with observational footage forms a multi-layered excavation into the illusion of cinema itself’. My response to a film immediately after seeing it is usually a reaction – that is to say emotional rather than intellectual – and I only really start to form a coherent opinion when I begin writing. In this case, I think that I need to watch it again because my response feels like it’s stuck in reaction to the visuals (very beautiful and eerily strange) rather than engaging with what is going on at a deeper level. One to return to at a later date. ‘Part meditative travelogue and part wordless maritime reverie, Transatlantique unfolds in the spaces of a cargo ship undergoing a transatlantic voyage between Antwerp and Montreal. The black and white cinematography registers the inkiest of blacks and blinding whiteness in the Atlantic’s unruly seascapes and, as the swaying motion of the ship causes a chiaroscuro dance on its surfaces, a complexly layered soundscape combines the sounds of the crew with audible elements of the ship and the encompassing sounds of the sea and wind in an evocative and transportive symphony. It was great to see the film on the big screen as my original viewing was on a computer (as I’ve said previously, I wasn’t able to see it in Edinburgh). Seeing it on that scale made certain things visible. 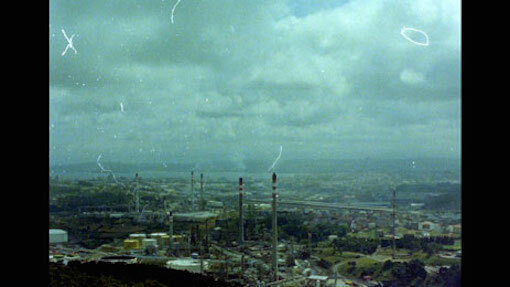 David Cairns wrote about the film during EIFF and he mentioned ‘a breathtaking shot of the sea, blackly luminous’ and wondered whether it was played in negative – watching it for the second time, on a larger scale, and having recently seen Noite sem distancia (Lois Patiño, 2015), it seemed to me that the image was indeed one from elsewhere in the film flipped into negative. Someone asked about it during the Q&A and Félix confirmed that that was the case but that he had also digitally cut part of the image so as to remove the horizon line. I’ll be presenting the film again on Thursday. I returned to the FICXLab screen for the last session on Monday, this time for a programme of shorts by Nathaniel Dorsky, Helga Fanderl, and Jonathan Schwartz. I’ve not seen any of their work before, so I didn’t really know what to expect. The programme was split into two, with Dorsky and Fanderl in the first half and then Schwartz in the second because the work of the first two complement each other whereas Schwartz’s films are quite different. The (silent) films by Dorsky (Prelude (2015) and Intimations (2015)) and Fanderl (Communing (2015)) have images of the natural world, repetition, reflection, and an emphasis on patterns of light and shadow in common (although the treatments are different), while Schwartz’s (a set of miniatures (2015), animals moving to the sound of a drum (2013), 3 1/33 series side a (2005-10), if the war continues (2012), 3 1/33 series side b (2005-10), Happy Birthday (2010)) utilise sound and the duplication of images to create worlds in miniature. My favourite of the evening was Fanderl’s film, although again my reaction was one of sensation rather than thought – but I’d like to see more of her films (which are shot on 16mm Super 8 and edited in camera). I will be writing a report for Desistfilm about the experimental section, so I won’t expand on these films any further for the time being. As I’ve already said, I didn’t manage to go to Santiago de Compostela for Curtocircuíto but the festival gave me access to most of the films in the competitive categories. Besides the films that I reviewed for Eye for Film (and some films that I saw in Edinburgh earlier this year – Scrapbook (Mike Hoolboom, 2015), I Am a Spy (Sarah Wood, 2015), and Sound of a Million Insects, Light of a Thousand Stars (Tomonari Nishikawa, 2014)), the standouts for me included World of Tomorrow (Don Hertzfeldt, 2015) [which is available to rent on Vimeo], The Liquid Casket / Wilderness of Mirrors (Paul Clipson, 2014), Embargo (Johann Lurf, 2014), Paisaje con perro roto / Landscape With Broken Dog (Orazio Leogrande, 2014), Tehran-Geles (Arash Nassiri, 2014), Descubrimiento de Américo / Discovery of Américo (Miguel Mariño, 2014), and Historia Cerebro / Brain Story (Borja Santomé, 2015). The latter two films were part of a collection of Galician shorts and given that I’ve been considering the Novo Cinema Galego recently, I decided to focus my festival report on films from that section – my report can be found at Eye for Film. I specifically focussed on Cruz Piñón (Xisela Franco, 2015), Hyohakusha, caminante sin rumbo / Hyohakusha, Aimless Wanderer (Xisela Franco and Anxela Caramés, 2015), and Volontè (Marcos Flórez, Helena Girón, Rafa Mallo, Roberto Mallo, Miguel Prado, Lucas Vázquez de la Rubia, Lucía Vilela, 2015). My choice of films was based on the connections that I could make between them but the collection as a whole illustrated the diversity of cinema being made in Galicia.